Ik ben heel tevreden over de producten van Label & Co na een tip van een vriendin. Leuk voor de kinderen om te maken en ze kunnen zelf het lettertype en de kleur kiezen. You can follow the whole process at the top of the page so you know exactly where you are. LABEL&CO recommends using Google Chrome or Apple Safari. It works safe, quick and fast! Click on the desired article on 'View'. Choose from the many possible, fill in any text you want. The order is now in the shopping cart. Now you can continue shopping or go straight to the checkout. *VAT and ICL: website orders are definitively including VAT. Check if your order details are correct. Here's what's in your shopping basket, using a clear overview of what you have specified. You can order labels based on a valid e-mail address. A customer account will be created. We need your address anyway so take your advantages in this matter. Besides, you have via your account always an overview of previous orders (order history), invoices and mutual communication. You can specify what the billing address and shipping address must be used. You can also use dropshipments for each order at no extra cost! You can specify multiple shipping addresses and use them with a simple click. Do you have a coupon/voucher* code? Enter the code, and the discount will be deducted immediately. * Discount / voucher codes can not be combined with tailor made work or stacked with other vouchers or be settled afterwards on orders already placed. At LABEL&CO, a gift is really a gift. If you want to use our gift service, just click the option. We will wrap the labels in a fun gift bag. You can even attach a personal message to your gift. > Then click on our terms and conditions 'for approval'. Select the desired payment method: Bank Wire, PayPal or Multisafepay. You will log on directly at the bank of your choice or your credit card provider, such as Visa, MasterCard or American Express. It cannot be more safe. Label & Co is certified PayPal and Multisafepay member and uses original SSL bank applications from the payment providers such as 3D Secure. Finish your order with your payment. Notice: Your account does not include any financial information nor passwords. It is not known to us and we will never ask for it. your order ~ the payment status ~ your personal production status ~ shipping. At the time we ship your order, you will receive an e-mail with this confirmation. From that day your order may be delivered. Normally, we manage a next day delivery in the Netherlands (if ordered before 11:00 am). Outside the Netherlands, it will take a couple more days. For the Netherlands, LABEL&CO endeavours to deliver all orders within 5 working days, after full payment is received, and within 10 working days for other countries. In general holidays and vacation time, deliveries can take a little longer than usual. 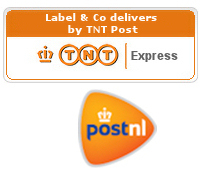 Due to lower employee occupancy of both LABEL&CO and the Dutch postage firm PostNL. Our websites are set up with prices definitely including VAT. For European ICL deliveries with an order value of less than € 100.00 Euro including VAT when a manual invoice to be made, we reserve the right to charge 15 Euros additional administrative costs. A valid VAT number and company name is required. However, you can note a VAT number in field "Additional Information" per address in your customer client information system at any time on our website(s). The most common is sent by regular mail. We ask for a modest contribution in shipping and handling, within the Netherlands only € 2.20; Europe € 2.90 and € 3.90 for outside Europe (except for web orders over € 30,-). Other methods are registered mail, urgent (within 24 hours) and super urgent (within 12 hours). Express deliveries just go on explicit request, at a current cost. LABEL&CO is not responsible and / or liable for loss, damage or exceeding of the indicated delivery of the labels. LABEL&CO has a no-nonsense policy: 100% customer satisfaction or money back guarantee or a replacement product. Please see our terms & conditions. In your account you will find an instant overview of the credit notes.